Braces can change the alignment of one’s teeth for a better smile, however they can also be an ideal location for plaque and bacteria to manifest and spread. If braces are not properly and routinely cleaned, they can cause irreversible damage to your gums and teeth. The wires and the brackets often get in the way of your toothbrush and dental floss. Even with the help of a floss threader, flossing around your braces is a time-consuming and frustrating experience. But using a water flosser, you can floss your entire mouth in just 60 seconds, and it will literally be cleaner than using a floss threader. Faster and more effective, that’s a win-win situation and why a water flosser is essential if you or your kids have braces. Below, we have reviewed the best Waterpik for braces that will improve your dental hygiene. Even if you don’t have braces, these will clean your teeth like nobody’s business. Keep in mind that there isn’t exactly a best water flosser for braces per se, all of these products can get the job done. However, we simply want to give you more options so that you can have a wider selection to choose from. It is hard not to recommend the Aquarius Professional WP-660. Even the American Dental Association thinks it’s an effective product and for good reason. For starters, the 22 oz. (650 ml) tank can provide 90 seconds of continuous flossing at even the highest pressure setting. For a countertop flosser, this is slightly on the low end, however it is more than enough and it keeps the product slimmer so it will not take up too much countertop space. The Aquarius Professional has a pressure dial that lets you select from 10 different pressure settings. From level 1 to level 10, you can choose from 10 PSI and 100 PSI respectively. For those unaware, 100 PSI is really powerful and would most likely even damage your gums or cause bleeding. We prefer to keep it around level 6-7 where it provides a powerful clean that is sure to eliminate all plaque biofilm. The WP-660 has a built-in timer which helps you pace yourself when flossing. It will signal when you should move to another area of your mouth so that you can clean your teeth and braces evenly. This is a nice quality of life feature to have, however it is not necessary if you simply keep an eye on how much water is left in the tank. Here is where Waterpik products really stand out as the water flossers to use for braces: the flosser tips. The Aquarius Professional comes with 7, but the one we want to focus on is the Orthodontic tip, which is specially designed to clean braces. The bristles on the end let you brush the wires and brackets, meanwhile the stream of water is removing any leftover plaque; an effective combination. Lastly, the nozzle of the flosser handle can rotate 360 degrees so that you can more easily angle the orthodontic tip to hard-to-reach areas in your mouth. Read our Waterpik Aquarius Professional WP-660 review for more information. Let’s face it, dental hygiene isn’t the most fun thing in the world, and even adults can find it daunting. Waterpik has tried to lower the barrier of entry by designing a custom Waterpik for kids. It is made for children over six years old with safety features like a kid-proof electrical cord design and a non-slip grip on the flosser handle. The WP-260 is smaller than other countertop Waterpik flossers, and it has been streamlined so that kids can easily figure out how to adjust its settings while still keeping its cleaning power. For instance, there are now three pressure settings and two interchangeable flosser tips. The Classic Jet Tip is great for general flossing, and the Orthodontic tip specializes in cleaning braces. The Orthodontic tip has been proven to be three times as effective as string flossing for eliminating plaque around brackets and other orthodontics. To further make the WP-260 accessible for kids, there are twenty removable cling decals that kids can stick onto the flosser to decorate it to their liking. If you thought the lively green colour of the flosser couldn’t get more flamboyant, you’d be wrong. 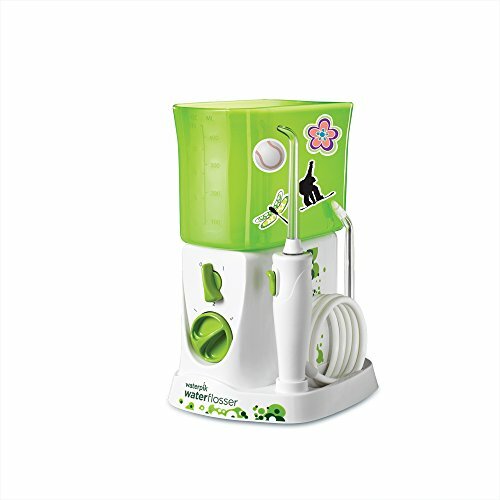 All of this combined together makes us believe the the Waterpik for Kids WP-260 is a great water flosser to make a tedious task fun again. It can encourage your kids to floss their teeth and build up the proper dental hygiene habits that will prevent many dental problems in the future. The Complete Care WP-900 is a classic that has been used by millions around the world for over a decade. It doesn’t have the fancy new features like a built-in timer and pacer, and it might be a tad on the larger side by today’s standards. However, there is a reason why this older product is still used to this day, and it is you can rely on it to get the job done. Water flossing is just one part of the equation when it comes to maintaining your dental hygiene. An electric toothbrush can remove over 20% more plaque than a standard toothbrush, so it is worth looking into as well. 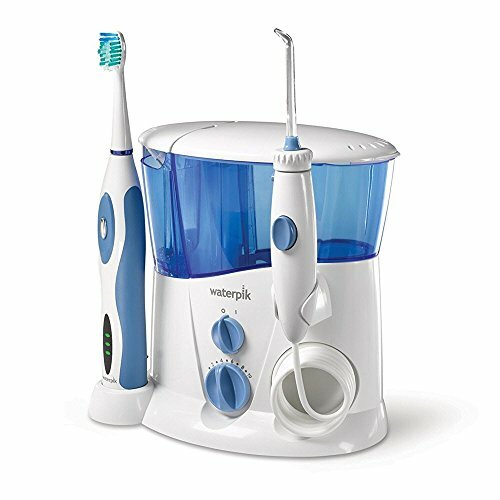 Which is why you should consider the Complete Care WP-900, an all in one solution that provides a water flosser and a rechargeable electric toothbrush in one package. What’s great about the WP-900 is that both products are combined together into one; you only need one power outlet to charge the device. If you had bought an electric toothbrush and water flosser separately, it would take up two sockets. Like all high-end countertop water flosser products from Waterpik, the WP-900 has 10 pressure settings to choose from. It also includes 5 flosser tips (including an orthodontic tip which specializes in cleaning braces) and two brush heads so you are prepared for every situation. The 23 oz. (700 ml) water reservoir can let you floss on the highest pressure setting for 90 seconds, and can last longer if you use a lower setting. Beside the water tank is the tip storage case for you to store the aforementioned flosser tips and brush heads when not in use. Comparing the electric toothbrush to the offerings from Oral-B and Sonicare, it falls short due to its lack of built-in pacer and two-minute automatic shut off features. However, it can remove plaque from your teeth and that’s all that matters. There is even a travel case if you need to take it with you on a trip. Overall, the Complete Care WP-900 provides immense value for its offerings since you are getting two products in one. Buying an electric toothbrush and water flosser separately would cost a lot more. And even though a toothbrush is not as effective at cleaning around braces compared to a water flosser, remember that someday your braces will come off, and the electric toothbrush will be eager to scrub your pearly whites clean without any wires getting in the way. See our Waterpik Complete Care WP-900 review for more details. As good as countertop water flossers are with their numerous pressure settings and ample flossing time, they are unfortunately not a feasible choice if you do a lot of travelling. That is why the Cordless Advanced WP-560 should be an option for you to consider. The main drawback of a portable water flosser is that the smaller water reservoir means you will run out of water, fast. They are also not quite as powerful as the countertop models; with that said, they are capable of removing plaque from your teeth and braces all the same. With the Cordless Advanced, you are getting a unit that boasts extra-quiet operation. Its built-in battery has rapid magnetic charging capabilities that allow it to recharge in 4 hours. The LED battery indicator located at the front will let you know when the battery is reaching low charge, and when it is fully charged. The electronic pressure system lets you cycle through three pressure settings: low, medium, and high. Compared to other Waterpik flossers that have 10 pressure settings, we feel that the low, medium, and high settings are roughly equivalent to levels 3, 5, and 7 respectively. 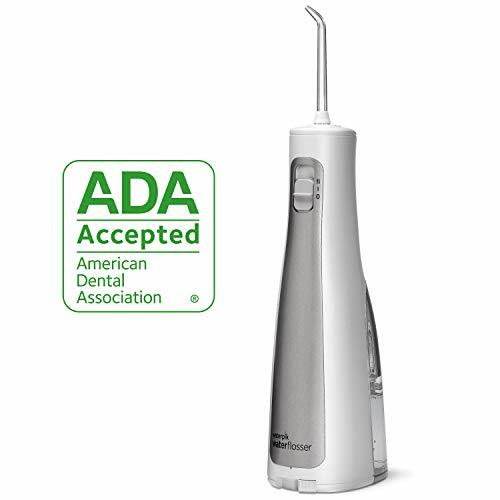 You can also customize the flosser tip on the Cordless Advanced. It comes with 2 Classic Jet tips, a plaque seeker tip, and of course, an orthodontic tip for superior cleaning for users fitted with braces or implants. Each tip can also be rotated 360 degrees to clean hard to reach areas. The Waterpik WP-560’s water proof design means you can even use it while showering. Lastly, you can also expect to receive a travel water plug to prevent leakage when you are carrying it around in the included travel bag. The bag can conveniently store everything so you don’t need to worry about bringing separate bags for the flosser tips. If you are interested, check out our Waterpik Cordless Advanced WP-560 review for a more comprehensive overview. Let’s round off our review with yet another cordless water flosser, the WF-03 Cordless Freedom. Having a water flosser with built-in rechargeable batteries like the Cordless Advanced WP-560 is fine and dandy if you are travelling within North America. However, they cannot be used anywhere else unless you want to fry the unit or you have a universal power adapter. The WF-03 Cordless Freedom circumvents this problem since it operates on AA batteries. If you are well stocked on batteries, you never have to worry about the charge running low or shorting the unit on a foreign power outlet. 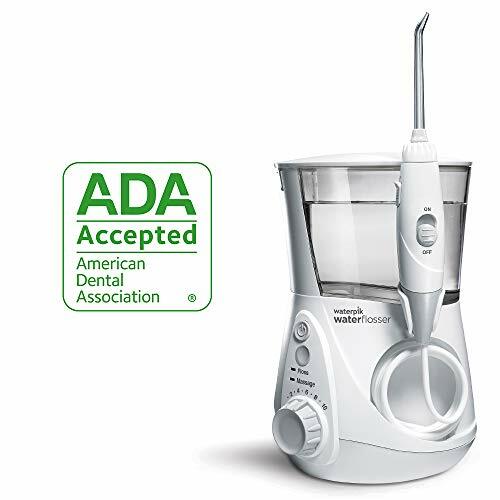 Other than that, the WF-03 Cordless Freedom is a budget option to the Cordless Advanced and it comes with most of the amenities you’d expect from a Waterpik flosser – namely, the interchangeable flosser tips and adjustable pressure control. There are only two pressure settings in this unit, low and high. We estimate they are equivalent to a level 4 and 7 on a unit with 10 pressure settings. The water reservoir is small like all portable flossers. If it got any bigger, then it wouldn’t be very portable anymore. One downside of this product is that you cannot rotate the flosser tips 360 degrees. To adjust the angle, you would have to maneuver the entire unit, which makes it harder to reach plaque around nooks and crannies. 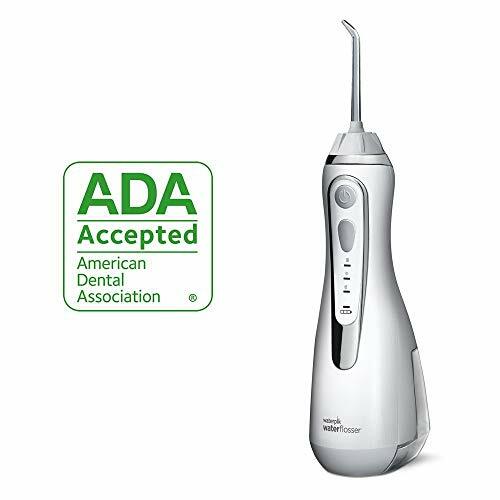 If you are someone who travels frequently to places outside of North America and want a cheap and reliable cordless flosser to take with you, then you can count on the Waterpik WF-03 Cordless Freedom. You can also read our Waterpik WF-03 Cordless Freedom review for more information. 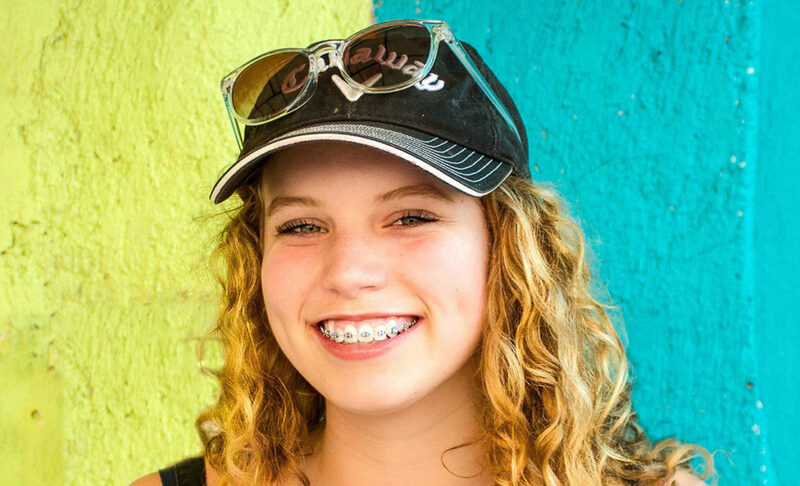 Those who have braces or other orthodontic appliances know how crucial it is to maintain their oral hygiene, even while traveling, because of how easy it is for problems to arise if plaque is not properly removed. That is why flossing is crucial for regular maintenance of oral health. However, brackets and wires get in the way of dental floss. Flossing becomes a chore to do and takes up so much time every day, yet you still need to do it. The products we reviewed above are the best Waterpik for braces and will save you much time and frustration. The powerful blasts from a water flosser will eliminate plaque on and around your braces with almost no effort. To further fight off plaque buildup and bacteria more effectively, we recommend adding an electric toothbrush to your repertoire.